Working our way up Southampton water, these guys passed us going the other way. The boat does not look that big, until you realise there are about twenty people standing on deck there. As best as I can tell, it is Velsheda. Anyway, they will be racing around the Isle of Wight on Saturday, so maybe we will get to see them then. I hope so, as with a full set of sails on, they would look pretty impressive - especially a fleet of them going by. So the day we got to Yarmouth, it turns out the olympic torch was going to arrive on the ferry, make it's way through the town then off elsewhere on the Isle of Wight. 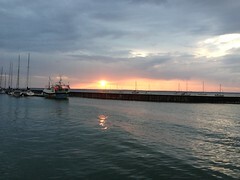 Now it has to be said I was already heartily sick of hearing about this torch long before we got to Yarmouth, but thought 'why not - seeing as we are here'. 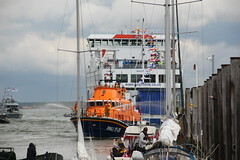 The picture you see is the actual ferry the torch supposedly arrived on, and some other boats. There was a fair crowd, and a band, to welcome the torch onto the island, so Patch and I stood with them, craning for a view ... of a motley collection of support advertising vehicles and lots of police. Anyway no sign of a torch, or anything on fire at all for that matter. What a farce. Somewhat later I did see some bloke standing around holding one of the olympic torches, or maybe a copy, but still no sign of any actual flame anywhere. 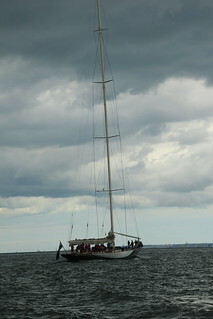 Finally Patch and I managed to sail Arctic Rose to Yarmouth, on the Isle of Wight, this last weekend. When I say sail, I actually mean motor, as the wind was from directly in front of us, with big rolling waves coming from the same direction, making doing anything other than travelling directly into the wind and waves distinctly uncomfortable. Anyway, the destination made up for any discomfort we had in getting there, as Yarmouth is a positively charming town. It's a garden bench, and nothing to do with the boat, I know. 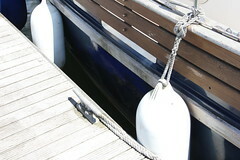 Actually it is relevant, as I've been looking into what to do about the exterior woodwork on Arctic Rose. I know from past experience that varnish, done well, looks beautiful. The trouble is that beautiful varnish finish just does not last outside in the weather. Good looks are important, I know, but I want to sail, not spend endless weekends on my hands and knees doing boat work. I've been there and done that. Enter the poor, neglected, garden bench. I'm thinking I treated that bench at the beginning of it's life with plenty of teak oil. Now it's been sat there for more than 10 years, with no care lavished on it at all. Now, after cleaning a section of the top rail with a scourer and sanding the seat, and with both re-coated with teak oil a few times, the top rail actually looks better to me than the seat. 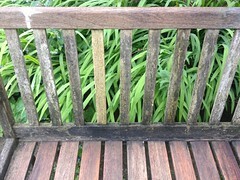 I do not doubt that the bench has survived so well mainly because of the teak oil treatment it originally received. I think this bodes well for Arctic Rose's woodwork. So the preval was a big success, with the spray job turning out somewhat better than I expected really. What was not so much of a success was the colour of the touch up paint. I know the picture does not show it so well, but the colour is definitely a sorry match. At the time I thought the wrong colour blue would look better than the scuffed sides. Now, having seen it, I'm not so sure. At the extortionate price I paid for the Awlgrip, the guys who sold me the paint have said they will see about putting it right. It occurred to me when asking the guys at http://marineware.com/ about the paint I needed, to ask if they knew of some kind of compressed air arrangement, like the spray paint cans you can buy, which would work with small amounts of their paint. The guys recommended I looked at Preval sprayers. As part of the whole storm damage repair job, I thought why not get a few - they are not that expensive and perfect for mixing up small quantities of two part paints. I must say, although quite small, they are very effective. Making a quality coating that is only possible when spray painting. Next time I spray with one of the Preval's, I'll also get myself a large syringe, so I can syringe up the paint and fill the glass Preval bottle without any mess whatsoever. The best thing is that the Preval sprayers are fairly cheap, meaning I can touch up small patches, then throw the whole lot away without having to worry about cleaning up any messy brushes or paint containers.